Stephanie O'Dea writes A Year of CrockPotting where she tries a new CrockPot recipe every single day. In this three part interview, she talks about how she got started with CrockPot blogging and why. She describes the benefits of cooking in a CrockPot and lets us in on some of her favorite recipes. Lastly, she talks about her recent experience as a guest on the Rachael Ray Show. 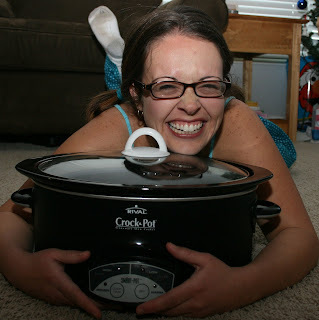 Stephanie O'Dea loves her CrockPot! How did you get started with CrockPot cooking? I really wanted to start a blog and I wasn’t comfortable with the idea of sharing too much family information. I really enjoyed reading the food blogs, but I’m not much of a cook. The only way I know how to cook is in the CrockPot. I was joking around with my husband and said, “You know what I’m going to do - start a CrockPot blog. The only way it will work is if I turn it into a New Year’s resolution." Instead of telling me I was mad, he said, “Hey, that’s a good idea! You should do it!” Then, it turned into a challenge to see if I could really do it. Are you saying that the resolution was a tool to make the blog a success? I knew through BlogHer [Stephanie works for them] that in order for me to answer bloggers' questions, I needed to know what I was talking about. I had to start a blog and it just happened to be all happening in December. Also, I like writing. I have a book coming out in the Spring on household organization for moms, and I knew that I wanted to have a presence online, but I couldn’t necessarily write about that kind of stuff because I was trying to sell it in the book form. The working title is “Totally Together: A Daily Organizational Journal for the Busy Household” or something like that. It will definitely have the “Totally Together.” I’m now in the second rung of editing it. I had been trying to sell this book for quite a while and the book got sold. It had nothing to do with the blog. It’s just interesting that it sold when I let my focus relax and stopped being so uptight. Depending on my mind frame, I can look at it as the universe needed me to relax. I am excited about the book and it looks like when the year of CrockPotting is over, I’ll start a blog related to that. I have the URL. Let’s get back to the blog. I was intrigued by the idea of moms making money from home without spending any money. So, I purposely started a Blogger blog and didn’t put any money into buying a URL or upgrading any of our computer equipment or camera equipment. I was just interested to see if you could start something from nothing. Are you able to make money with your blog? I have two small children and so I do work from home. I have a few different freelance writing jobs that I do. I like the idea to show moms that if you are staying home, you can make a little bit. This is definitely supplementing our grocery bill. Although, we are cutting even because I am shopping more. But, we are also not eating out this year. One other thing with getting the blog started - Elise Bauer of Simply Recipes had posted on BlogHer about how to have a highly trafficked blog. I followed her steps. I chose to spell CrockPot wrong in order to get the misspelled Google searches. CrockPot is actually spelled Crock-Pot. I spell it wrong. I figure if you type it in correctly, you’d get the actually crock-pot website. I figured if people were Googling, spelling it wrong, maybe they would end up on my page. I get probably half Google searches and half people who I guess are bookmarked. Are there any recipes that you tend to avoid? Most of my recipes try and steer clear of the cream of mushroom type soup. Many CrockPot books have that as a base. Because they’ve already been done, it just seemed a little bit like cheating: "Hey, let’s cover pork with a cream of mushroom soup. Now, let’s cover this with cream of mushroom soup. Everything tastes good when covered with cream of mushroom soup!" I did make our own cream of mushroom soup in the CrockPot and I froze it in little baggies and that’s quite flavorful and delicious. It’s brown, which is a little off-putting if you grew up with white. Also, everything we do is gluten-free, so we have an additional hardship. Does this not work because it’s gluten-free, or because we did it in the CrockPot? You never know. Readers don’t seem to care if it tastes good or not, as long as you’re honest: “Good for you! You gave it a go!” They are very sweet. The blogosphere is very forgiving to honesty! Why are you doing gluten-free? My three year old has Celiac and we decided as a family to all eat gluten-free. Do you ever make last minute meals? I have a pretty elaborate schedule and checklist. I do plan ahead for meals. We always have the makings in the house for quesadillas and for sandwiches and salad stuff, so we’re not going to starve. Some of Stephanie's readers said she was cheating when she repeated recipes for a CrockPot party. Do you ever make recipes more than once? There are times when we’ll make a dinner that’s really good and I’ll repeat it for the kids for lunch or if we are having company. I’ve made the desserts and appetizers quite a few times for company but I don’t repost them. If you read the resolution, all I said is that I would use it every day. 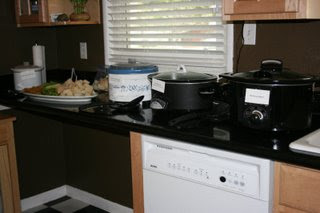 But, once I posted a CrockPot party and I had all of my different CrockPots lined up. I used the same recipes and I had a few people email me telling me that I was cheating (which is pretty silly, since it’s my own thing), but I feel like they actually want 365 recipes. Have you ever wanted to stop? There have been a few times when the kids will roll around on the floor and say, “I don’t want to eat out of the CrockPot!” But, they kind of rally around it. They know that it’s just for a year and it’s fun. They joke around and they’ll make up things. My 6 year old keeps bringing me things she has made up to put in a CrockPot – like a pound of butter and two apples. I think in their brains, they think that anything you put in there turns into a magic machine and it will taste good. I made macaroni and cheese the other day and it was really tasty. Stephanie’s child in the background: Dad threw it away. Stephanie: Yeah, Dad threw it away. We left it out on the counter overnight and we had to throw it away. I don’t like to cook. I don’t miss the stove at all. I don’t like oil splatters on the stove. Little things like – I’ll put on a pot of soup for lunch for the kids and then I wander off and all of a sudden it boils over. That doesn’t happen in a CrockPot. I feel like it was made for the absentminded chef (which is apparently what I am). I have a bunch of things happening all at the same time – always. I can put this on and walk away for six hours and not have to constantly check on it. What do you do if you need to go on a vacation? There’s been a few times where we have needed to travel that I’ve cooked two or three things at once in different CrockPots. We’re halfway through and I haven’t had too much of an issue with getting it done. Wow! What an awesome write-up, Stef. I'm totally hiring you to write my next resume. it IS a great write-up! i have LOVED trying so many of steph's recipes and have so enjoyed the freedom it allows our family. i'm so glad you're spreading the news here! It's a great project, for sure. If you keep blogging after a year, as I did for A Veggie Venture after doing a new vegetable recipe every day for a year, you can actually go back and improve / replace some of the recipes that are classics and bear repeating. At least that's what I'm doing, I actually keep a list of what needs attention. The day after my stove went to the repair shop, a friend e-mailed me Stefanie's blog. Now, I have it bookmarked and visit her everyday! Great interview. Great interview. It's good that you caught your child's Celiac early. I had a friend who wasn't diagnosed until she was 25. A writer friend of mine told me about Stephanie's blog earlier this year, and I've been subscribing ever since. I love Stephanie's down-home, I'm-a-real-gal approach not only to cooking but also to writing. The readers of my blog The Lean Green Family (formerly Suddenly Frugal) really loved it when I linked to Stephanie's post on reusing crayons via the CrockPot. Now that's thinking outside the Crock. Hey, Stephanie. Maybe that should be your new logo? P.S. I would love to read that Elise Bauer piece from BlogHer on increasing traffic to a blog. Loved your interview! You are a hoot! It really hit home, too. Your comments about "letting my focus relax...stop being so uptight...universe needed me to relax" was just what I needed. I'm getting my classroom ready for back to school. They're even going to use it as a "showroom" for new teachers next week. No pressure! Gasp! So I am going to take the day off. Part of it will be spent gathering recipes from your site for the coming hectic weeks. Thanks and kudos on your adventure! thanks, Kristal! I'm so glad that you are getting more use out of your crock. alanna, I didn't know that A Veggie Venture started up as a year-project. I'm going to spend some time digging through your archives. what a cool idea! jenny, I'm sorry to hear that your stove died. Jennette, I know. We have an amazing pediatician. Leah, here is the link to Elise's article series. It's very well done, and if you can ever make it to a BlogHer conference, her session is amazing. Jayne, good luck in school! yup, that universe is something else. :-) I bet your room looks amazing. My daughter has Celiac as well so I look forward to trying some of your recipes! Best of luck! Good Day!!! www.foodinterviews.com is one of the best resourceful websites of its kind. I enjoy reading it every day. All the best.